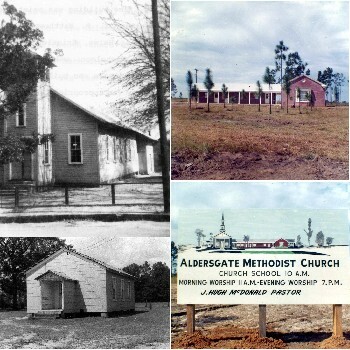 In October 1965, the members of Molino Methodist Church and the members of Pleasant Grove Methodist Church joined hands to create an experience of unity and cooperation that became Aldersgate. Both of these churches had deep roots and rich heritages and it was hard for the members to leave their buildings behind and move to a new location. The Pleasant Grove (Crabtree) Methodist Church dated back to the early 1900's, and was a spur from Lathram Chapel Methodist Church. The first church was built of logs and was blown down during a storm in 1906; the second church burned. The third church building (bottom-left picture) was the building used for worship until the merger in 1965. This building was burned by an act of vandalism in 2003. An annual Homecoming is still held in the new pavilion which has been built on the church grounds. The cemetery is located behind where the building stood and is maintained by family members and elected Trustees. The Molino Methodist Church congregation was moved from the Pine Barren Methodist Church in about 1911. Services were first held in homes and later upstairs in the Escambia Mercantile Building (present-day Molino Masonic Lodge building). The Molino Methodist Church (top-left picture) was built around 1916. This building remained the place of worship until congregation merged with the Pleasant Grove congregation in 1965. 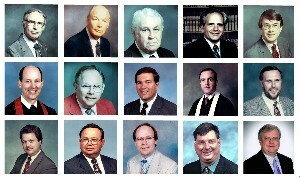 Thus a dream of many years became a reality, Aldersgate.